Myles Martin's fourth and final NCAA Wrestling Championship may have been the toughest tournament of his career. The preseason No. 1 at 184 pounds went wire-to-wire in the regular season as the undisputed king of the hill, rolling into Pittsburgh as one of a select few undefeated contenders. Martin's upset in the 184-pound semifinal was one of the biggest shocks of the tournament, as he fell to No. 5 Max Dean of Cornell – an opponent he'd defeated twice earlier in the season. "Myles... it was just heartbreaking," Ohio State coach Tom Ryan told Eleven Warriors. "I don't know where God's plan is in this – it's tough right now to make sense of it all. But he'll bounce back tomorrow. He loves the University, he loves the program and tomorrow he'll bounce back and take third." Bounce back, he did, winning both consolation matches Saturday and earning a Third Place finish in his last tournament as a college athlete. 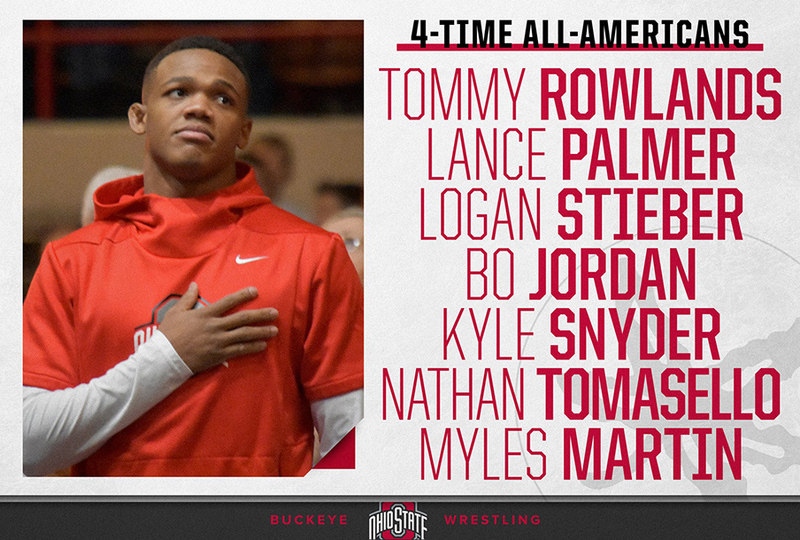 Martin is just the seventh Buckeye in program history to earn four All America finishes, joining the elite of the elite to ever wear a scarlet and gray singlet. Without question, Myles Martin's loss to Max Dean was the biggest upset of the tournament. For starters, Martin had defeated Dean handily not once, but twice previously this season: a 17-7 major decision at the Cliff Keen tournament and a 13-6 decision at the dual meet in Ithaca a month ago. Ohio State's only No. 1 seed of the tournament, Martin's path to a second NCAA title represented the closest thing to a layup on the roster. With Penn State's Shakur Rasheed taking an early exit from the tournament despite his overly generous second seed, Martin's date with destiny seemed assured. Getting up Saturday morning to wrestle two more matches after a last-second loss to an opponent you beat running away twice can't be an easy thing to do. Showcasing his integrity and mental toughness, Martin got up and wrestled one of his smartest matches of the tournament in the consolation semifinals against No. 4 Emery Parker of Illinois. As with Dean, Parker was familiar opponent for Martin, and one he's bested twice in the past seven weeks. Martin wrestled a cautious match through two periods, trailing Parker by a single escape point going into the third period. A quick escape by Martin tied the score at a point apiece, and a pair of takedowns in the final frame gave him the 5-2 decision and a spot in the third-place match. That bout became a rematch of the quarterfinal round Friday morning, as Martin was again pitted against No. 8 Ryan Preisch of Lehigh. The Buckeye won big in the first meeting, advancing to the semifinals with an 11-2 major decision. Their second meeting wasn't as high scoring, as Martin adopted a more battle-weary approach. He scored early with the first takedown of the match, and held a 3-1 lead going into the final period; he tacked on another takedown in the third for a 5-3 decision and the third-place finish. Martin brought the crowd to their feet, and the Buckeye faithful in attendance called out the O-H I-O cheers from the upper reaches of PPG Paints Arena. Martin finished his career having placed no worse than 5th at the NCAA tournament after opening his career with an NCAA Championship in his true freshman season. His career record of 121-19 has him just outside of Ohio State's Top 10 all time by winning percentage, but there is little question his influence on the program will be felt for a while to come. After his victory over Presich, he confirmed that he will continue to pursue his international aspirations as a freestyle wrestler by training at the Ohio Regional Training Center alongside world champions Kyle Snyder and Logan Stieber. "It's the best situation for me, with the guys around my weight class," Martin said. "I love the place, it's like home." He spoke in particular about his relationship with Snyder, a fellow Maryland high school standout and three-year teammate in Columbus, as well as the influence of Buckeye head coach Tom Ryan and their shared faith as reasons for staying at Ohio State for at least the next year of his training. "When I came to Ohio State I just wanted to make an impact on the program, and I think I did pretty well the last couple of years," Martin said. "Obviously there are some goals I wish I could have gotten." "It was tough getting motivated to get my body going after a tough loss yesterday," Martin said Saturday after the final match. "I think yesterday I was just overly confident and a little out of focus when things got tough and then today I just hurt, but I just had to do it for my team and for God." The final result was one that few would have predicted, but Martin's ability to gain perspective and move on to the next match is a testament to his character, and to his potential as a competitor on the international stage now that his days of NCAA competition have come to a close.